LILY LOLO Eye Liner & Smudge Brush is perfect to contour your eyes and smudge mineral eye shadows ! Its multifonction tool allows precise eyelining, inner corner highlighting and delicate smudging. Use it wet to transform any powder eyeshadow into a creamy eyeliner ! Acclaimed by international makeup artists for their professional quality, Lily Lolo Brushes are made from synthetic hairs that's ultra soft and resistant. With this amazing makeup brushes line, even the most sensitive skin can forget about itching and scratching ! 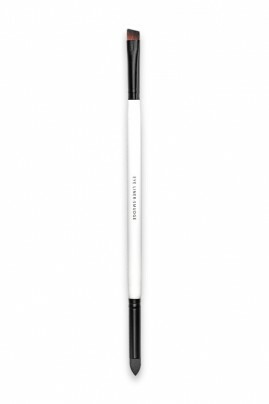 THIS 2 IN 1 LILY LOLO EYELINER & SMUDGE BRUSH IS SO CONVENIENT ! 2. Take some of it with Lily Lolo's Double Brush Eye Detail side, and tapp off the excess. You can use the brush wet to create creamy eyeliner ! 3. Apply the eye shadow close to your upper and/or inner lash line, until desired effect. 4. Blend the eyeliner using the Smudge side of the brush.